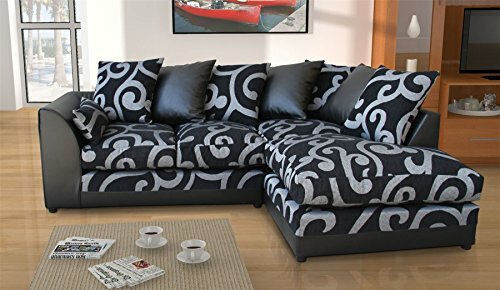 We are happy to stock the excellent New Zina Black Swirl Fabric Corner Sofa with 2 or 3 Seater, Footstool, Armchair. With so many available today, it is wise to have a name you can recognise. 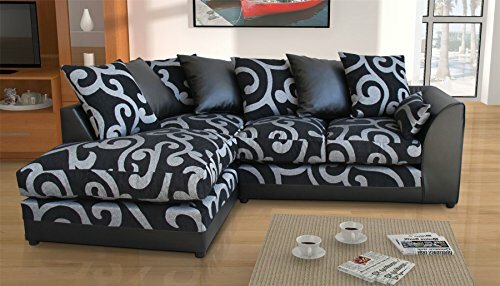 The New Zina Black Swirl Fabric Corner Sofa with 2 or 3 Seater, Footstool, Armchair is certainly that and will be a perfect purchase. For this reduced price, the New Zina Black Swirl Fabric Corner Sofa with 2 or 3 Seater, Footstool, Armchair comes highly recommended and is a regular choice with lots of people. Abakus Direct have added some excellent touches and this means good value. Whether you're looking for a corner group or a sofa, the Zina range provides an unbeatable combination of style and worth. A combination of soft structured chenille and stylish faux leather material together with deep filled fiber seats and backs make the Zina as comfy as it is stylish. Overall size of the corner sofa - (W)212cm, (D)164cm, (H)78cm 2 Seater - 160cm, 3 Seater - 180cm Armchair - (W)91cm X (D)86cm X (H)78cm Footstool - (W)60cm X (D)50cm X (H)42cm We don't deliver to N.Ireland, Scottish Highlands and Islands.